Marvel's 'Spider-Man 3' is sure to be a hit. But the stock won't be, says Fortune's David Stires. NEW YORK (Fortune) -- Given the monster merchandising campaign that includes everything from web-blaster toys to Slurpee cups, you'd have to be living on another planet not to know that 'Spider-Man 3' hits movie theaters on Friday. Investors have certainly taken note. Shares of Marvel Entertainment (Charts), owner of the rights to the superhero, have climbed 50 percent in the past year, clobbering the 14 percent return of the S&P 500. But assuming investors follow the usual script on how to play the stock, it's now time to sell. Flash back to 2002. The first Spider-Man flick was released in May of that year and was wildly successful, generating $820 million at the box office worldwide. But over the next three months, Marvel's stock fell 50 percent. The sequel, which was released in June 2004, was also a smash, taking in $780 million. Yet only a month later shares were off 35 percent. Spidey, an ogre and pirates: Who wins? What happened? The problem is that Marvel has become popular with the fast-money crowd, who prefer to cash in on the "Spider-Man trade" rather than hold the stock for the long term. Take a look at some numbers and it seems a similar story is about to unfold. After the stock's big gain, shares now trade for a lofty 44 times trailing earnings. That's twice their historical average. Meanwhile, 22 percent of Marvel's shares are being sold short - triple the market's average. That means a large number of investors are betting the stock will fall. Put the pieces together and the following picture emerges: "The Spider-Man trade is on," says David Bank, an analyst at RBC Dominion Securities. So should you buy after the likely sell off? Be careful. Marvel has just radically changed the business model in which it licenses the rights of its characters to film studios such as Sony Corp. (Charts) Now the New York firm will produce many of its own flicks in-house, including Iron Man as its first film, in 2008. "This certainly increases the risk," says Harold Vogel, a veteran film-industry analyst who heads Vogel Capital Management. "Producing movies is a different game." Indeed, the new venture is a radical departure for Marvel. For most of its 60-year history, the company was a successful comic-book publisher. But then billionaire Ron Perelman purchased it in 1989 with visions of turning it into his personal media empire. He made a series of ill-timed acquisitions that loaded it up with debt and eventually drove it into bankruptcy. Marvel emerged from Chapter 11 in 1998 with Peter Cuneo, a turnaround specialist, at the helm. Cuneo remade Marvel by treating its 5,000 characters as brands and licensing them to moviemakers, toy manufacturers, television producers, and video game designers. The makeover saved the day - for a while. By licensing its characters to film studios, Marvel collected a portion of each movie's profits without committing a lot of cash. Sales doubled in the past five years, to $350 million. More than half of the firm's operating profits came from licensing. But licensing also meant that Marvel gave away most of the riches - which was particularly painful when its films became blockbusters. 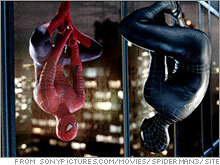 In the case of "Spider-Man 2," analysts estimate that Marvel received just 5 percent of Sony's box-office take. Under the new arrangement, Marvel will deliver up to ten films to Viacom's (Charts) Paramount Pictures, with production budgets ranging from $45 million to $180 million. The deal allows Marvel to keep a much larger share of the box-office revenues, while retaining the lucrative merchandising rights. But there are risks as well. Although Marvel says it has been intimately involved in the movies it has licensed so far, producing is another ball game. From developing scripts to casting actors, making a hit movie is an inexact science. And if the movies bomb, Marvel stands to lose the film rights to the characters used in the movies since the company used them as collateral for a $525 million funding arrangement with Merrill Lynch (Charts, Fortune 500). Finally, you have to wonder how many hits Marvel has left. Even Peter Cuneo, who's now the firm's vice chairman, admitted at a recent investor conference that only a dozen of its 5,000 characters are "A-list properties." And many of them, including Spider-Man, the Incredible Hulk, and X-Men, have already been mined. He's now trying to play up little-known characters such as Ant-Man and Moon Knight. Marvel would certainly be a fun stock to own. But lifting its share price in coming years may be too tall a feat even for its superheroes.